Glock 17 & 18 9mm 31rd ETS Mfg Magazine, Smoke, New. New ETS (Elite Tactical Systems) 31rd drop free 9mm magazine for the Glock 17/18 and similar (19,26,34). 8ft extreme impact resistant, chemical resistant, UV and temperature resistant, and lips and body will not spread when being stored long term loaded. Translucent smoke body allows easy round count. Has ambidextrous mag lock cuts for use in Gen 3 or Gen 4 pistols. Made in the USA. Consistent feeding in both G19 and G34. Full capacity loading without difficulty. 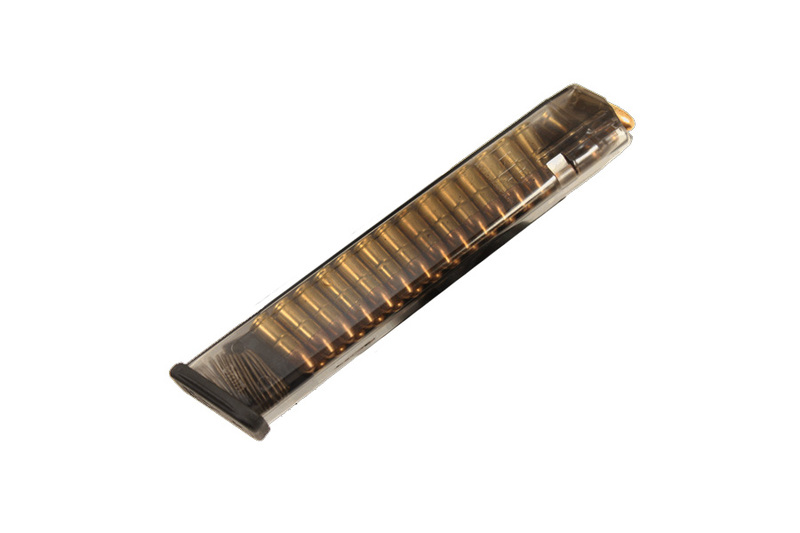 Less expensive than Glock Factory magazines and transparency is a nice feature. Single outing with about 5 loadings and no problems. Shipped quickly and in original packing. I would purchase again. I gave it 5 stars because it looks really good, but I have not had time to go to the range at this time. Fast, secure shipping. I would buy it again.